Avia is home to magnificent creatures. You have the colossal arrak, the intelligent erfang, the majestic loifern and the deadly armaril. And then, at the opposite of the magnificent scale…the wocco. 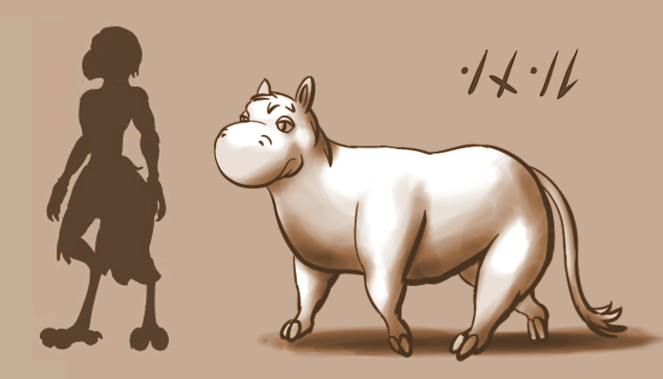 A passive creature by nature, these bulky grass eating fellas were one of the first creatures to be domesticated by the avin settlers. Ever since, they’ve become an incredibly common animal in all regions of avia. You’d be hard pressed to find a single avin who’s not familiar with them. And so, because of its predominance, simplistic behavior and poor intelligence, they’ve gained a reputation of being mundane and unimpressive. That’s not to say the woccos are completely useless or uninteresting. For starters, the woccos are perfect work animals. Their endurance makes them capable of performing several tasks such as carrying loads on their backs, pulling carts, plowing fields and serving as short-distance transportation for the walk-impaired (and occasional lazy) avin. Additionally, as one can easily tell by their appearance, they make excellent sources of meat. Sliced wocco skirt cooked with citrus juice, for example, is one of the many typical dishes that can be made from this animal. And of course, there’s their manure, which makes a good fertilizer. It is a pity that an animal with such a signicant place in avin society is given for granted so badly. Perhaps it’s their perpetually bored eyes or sluggish movements that have earned it such fame. Lethargic avin are often compared with woccos, and expressions such as “don’t go wocco” are commonly uttered to those who are slow and clumsy or merely pretending to be in order to avoid doing their job. Nonetheless, the woccos are sure to remain a stapple animal in avin’s everyday lives, even if dignified status lies somewhere between their hooves and the ground.